birds : It was a trifle worrying that, despite all the searching, no-one could find the Pacific Diver yesterday, so when I got the call that all the island's schools were closed (yey! ), Grandes Havres was my first port of call. I pulled into the car park at Rousse Headland and immediately saw a diver fishing close in just off the rocks. Getting the 'scope out, I soon saw that it was the Pacific and I got back into the car to phone the news round the grapevine as I knew that most people still hadn't seen it. However, when I looked for it again it had disappeared, and it was a good 15 minutes or so before Kevin re-found it way over the other side. And it kept doing this and was exceptionally mobile, and promptly disappeared again just before some people started to arrive. There were the 2 Great Northerns still present and we thought we'd found it again but it was just the Black-throated Diver. Just as I was thinking of giving up since the weather was getting windier and it had started to sleet, I saw a very distant diver swimming in front of Ladies Bay. It was into the light so it was difficult to tell, but we tracked this bird as it swam at such a speed, probably surfing on the incoming tide, right into the bay at Sandy Hook. We drove round there and had close views just off the beach by the Vale Pond car park, but again it swam out of there very quickly. So I was very pleased to get good views in the field, but it was difficult to study the minutiae of the plumage details, since it was constantly diving. Also in the bay I saw a probable Black-necked Grebe but I left it to search for the diver, and at home a pair of Blackcaps were feeding in the bushes opposite. nonsense : Whilst we are in the grip of this cold snap, the schools were closed today and will be tomorrow too. It seems a bit farcical to close down the whole school system when there was less than a cm of snow but it is the ice which is causing the problems rather than the snow. As Guernsey gets so little frost, there is no gritting of the roads at all and, perhaps due to local climatic conditions, the roads turn into ice rinks. So, for the sake of public safety, it is only right that the authorities gave me a day off work. I'm devastated though that the island's children will miss out on some education but one cannot gamble with people's lives! And anyway, I have spent all day working hard from home . . . . "E.T.A." by Henrik Clausen . 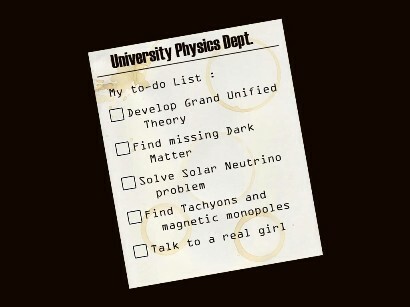 I also found some science-based jollity, including this list which I have adapted slightly and made a picture out of. This has a resonance for me as I first went to University to study for a Physics degree but I soon discovered that everything and everyone was exceptionally dull, so after a year I transferred to the wild and crazy world of the Chemistry Dept. Top Chemistry joke : Two atoms walk into a bar - one says "Oh no, I think I've lost an electron" - "Are you sure?" - "I'm positive".